Having a well-fitting product solution plays an important role in preventing leakage and keeping skin healthy. Good stoma care routines also help to maintain healthy skin. By following the Apply-Remove-Check routine, you can make sure your baseplate is more secure and dependable. When applied properly, your products will do a much better job of protecting the skin around your stoma against output, a major cause of irritation. A correct baseplate change routine starts with the proper application of your product. To secure optimal adhesion the baseplate should be applied to clean and completely dry skin. Clean water is sufficient for the cleaning of your stoma and skin around it. When it comes to fitting your ostomy baseplate, the hole should be cut so that it fits the diameter and shape of your stoma exactly. A good rule is ‘not too loose, not too tight’. 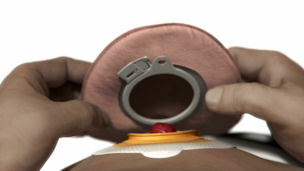 Remember that over time your stoma may change in shape and size. This is common and simply means that you need to adjust your cutting template accordingly. In order to make sure you’re applying optimally, check the size of your stoma periodically, especially if you have a hernia. You should always contact your stoma care nurse if you are in doubt or notice any changes in the surface of your stoma itself, such as changes in colour or texture. To protect the skin around your stoma it is essential that you use a well-fitting ostomy solution that enables you to obtain a secure and snug fit. Your body profile may change over time so it is advisable to take a BodyCheck every now and again. Find out more about Brava Protective Seal.